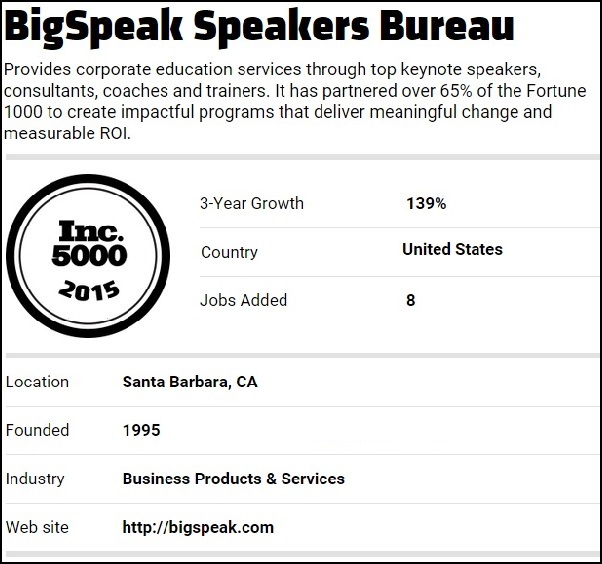 Santa Barbara, August 12, 2015 — Inc.com added Santa Barbara business, BigSpeak Speakers Bureau on its 34th annual Inc. 5000 – an exclusive ranking of the nation’s fastest-growing private companies. The list represents the most comprehensive look at the most important segment of the economy—America’s independent entrepreneurs. 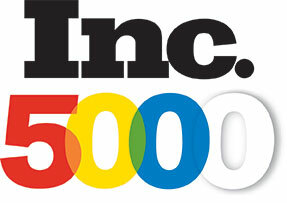 Companies such as Microsoft, Yelp, Pandora, Dell, Domino’s Pizza, LinkedIn, Zillow, Oracle, Intuit and Zappos gained early exposure as members of the Inc. 5000. Aggregate revenue from the 2015 Inc. 5000 list is over $205 billion, generating 647,000 jobs over the past three years. Located on the “American Riviera” (Santa Barbara), BigSpeak is a full-spectrum speakers bureau, representing the world’s finest motivational keynote speakers, consultants, trainers, thought-leaders, world-class athletes, best-selling authors, award-winning entertainers, and global icons. Over 65% of the Fortune 1000 partners BigSpeak to create hundreds of events each year. BigSpeak began in CEO Jonathan Wygant’s garage two decades ago and has grown tremendously, impacting thousands of businesses and individuals each year with transformational change. As of July 2015, BigSpeak has served over 4,200,000 audience members with impactful keynotes, training, and coaching that result in proven ROI. Wygant founded BigSpeak to address the unfulfilled need to provide top thought leaders, keynote speakers, professional development programs that are uniquely customized to each client’s specific requirements. President Barrett Cordero has been at the helm of the tremendous growth, focusing on sales, speaker representation, key investments, disruptive innovations and providing an exceptional work environment. BigSpeak team members enjoy flex-schedules, remote work, pet and child-friendly offices, HSA/FSA health plans, pension plan, profit sharing, and off-site team building trips.